HIT PICK TO CLICK: PLANETARY #27 (Warren Ellis / John Cassady) The explorers of the bizarre conclude their ground-braking Wildstorm series in this oversized issue, as Elijah Snow makes one last errand. MARVEL: Marvel's most brutal vigilante gets a 'mature readers' title with PUNISHER MAX #1. The former Dr Strange: Sorcerer Supreme looks for enlightenment in STRANGE #1 (of 4) by writer Mark Waid. Plus Brian Michael Bendis and Michael Oeming's creator owned hit returns with new super-hero homicide cases in POWERS #1. DC COMICS: Outside the Blackest Night Tony Bedard takes Grant Morrison's Asian based super-hero team for a spin in THE GREAT TEN #1, and for fans of pulp Brian Azzaarello's BATMAN/DOC SAVAGE SPECIAL brings the heroes face to face, in an alternate noir-ish DC Universe. COVER OF THE MONTH: AMAZING SPIDER-MAN #612 A jolt of 1,000 watt design sees Marko Djurdjevic's use the strong iconography set this cover alight. 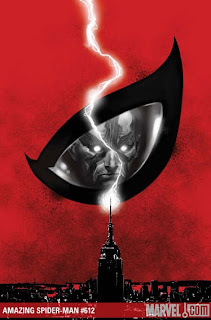 The Empire State Building, and the eye shape of Spider-Mans mask, creates a dramatic image heralding the return of my favourite Spidey villian; Electro.